2Department of Psychology, Lund University, Lund, Sweden. Received May 5th, 2011; revised July 15th, 2011; accepted August 19th, 2011.
cerning psychological and physical well-being was acceptance, which can be classified as engagement coping. emotional responses elicited by the stressful situation. complementary rather than distinct and independent categories. and includes strategies such as avoidance and denial. ated with psychological distress (Coyne & Racioppo, 2000). to prevent the employees from developing ill-health. much or very much stress (Muhonen, 2010). they usually did when dealing with stress at work. the LOT-R are considered to indicate increased optimism. on a four-point scale from 0 (none) to 3 (severe). 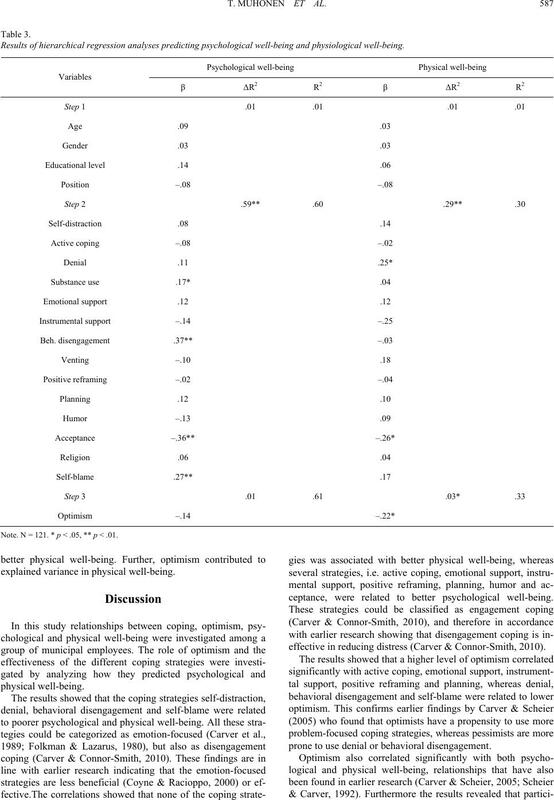 well-being also showed acceptable reliabilities (α = 74 - 88). Descriptive statistics and Cronbach’s alphas for the s t udy variables. 1. Age 46.99 8.74 n.a. 2. Gender 1.89 .31 n.a. 3. Educational level .44 .50 n.a. 4. Position 1.91 .29 n.a. Note. N = 130 - 134. n.a.= Not applicable. coping strategies was related to better physical well-being. Correlations for the s t udy variables. 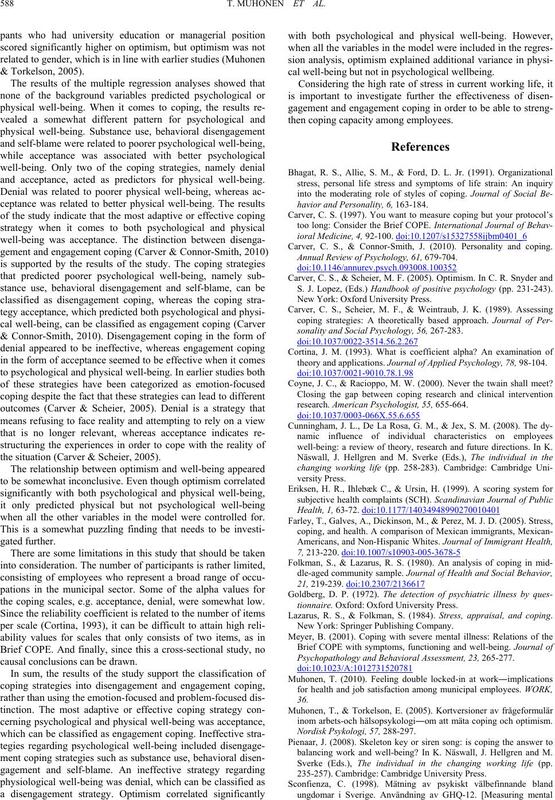 Results of hierarchical regre s s i o n a nalyses predicting psychological well-being and physiological well-bei ng . Note. N = 121. * p < .05, ** p < .01.
explained variance in physical well-being. ceptance, were related to better psychological well-being. effective in reducing distress (Carver & Connor-Smith, 2010). prone to use denial or behavioral disengagement. and acceptance, acted as predictors for physical well-being. the situation (Carver & Scheier, 2005). when all the other variables in the model were controlled for. the coping scales, e.g. acceptance, denial, were somewhat low. causal conclusions can be drawn. 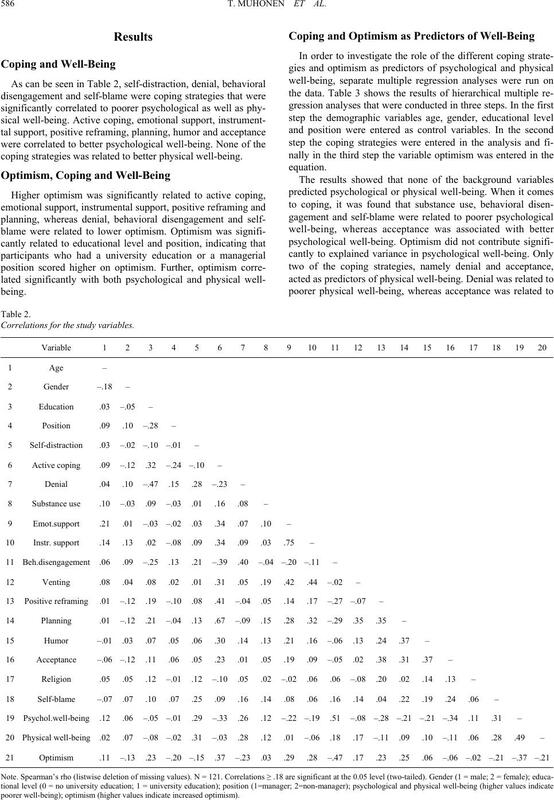 cal well-being but not in psychological wellbeing. then coping capacity among employees. havior and Personality, 6, 163-184. Carver, C. S., & Connor-Smith, J. (2010). Personality and coping. Annual Review of Psychology, 61, 679-704. S. J. Lopez, (Eds.) Handbook of positive psychology (pp. 231-243). sonality and Social P sychology, 56, 267-283.
theory and applications. Jou rnal of Applied Psychology, 78, 98-104. Coyne, J. C., & Racioppo, M. W. (2000). Never the twain shall meet? research. American P sy ch ol og is t, 55, 655-664.
well-being: a review of theory, research and future directions. In K.
tionnaire. Oxford: Oxford University Press. Psychopathology and Behavioral Assessment, 23, 265-277.
inom arbets-och hälsopsykologi―om att mäta coping och optimism. balancing work and well-being? In K. Näswall, J. Hellgren and M.
Sverke (Eds. ), The individual in the changing working life (pp. 235-257). Cambridge: Cambridge University Press. update. Cognitive Therapy and Re s ear ch , 16, 201-228. Personality and Social P s y chology, 67, 1063-1078. (Eds. ), International handbook of work and health psychology (pp. 99-121). Chichester: John Wiley & Sons Ltd.
for classifying ways of coping. Psychological Bulletin, 19, 216-269.
symptoms among women and men in a downsizing organisation.